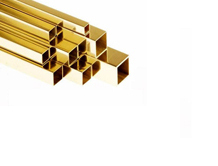 We Ambuja Tube Fitting is one of the leading manufacturers, suppliers and exporter of Brass Square Pipe.The offered pipes are manufactured with the help of premium quality brass sourced from reliable vendors in the market and technically advanced tools in compliance with set industrial norms. These pipes are applicable for different purposes in a number of industries. We offer these pipes in various lengths and sizes for our clients to choose from.